At the 2008 International Space Development Conference (ISDC) in May, NSS and Virgin Galactic announced the launch of Space Ambassadors—a new program that will encourage space enthusiasts to share their passion with local communities and award one person a suborbital spaceflight aboard Virgin Galactic’s SpaceShipTwo. The program constitutes a milestone for the Society: After decades of celebrating space and those who explore it, we finally have the opportunity to send one of our own members into space. If you are interested, you can sign up online via the Space Ambassadors page to receive project updates. As of this writing, nearly 3,000 people have expressed their intent to join the program. The official registration process is expected to be posted in fall 2008. Space Ambassadors will be trained to deliver a new presentation designed to educate and inspire the public about the benefits of space exploration and research. Using video and animation, the presentation will serve as an updated version of the successful NSS slide show program. Ambassadors will make presentations to a variety of local groups, such as schools, Rotary Clubs, and churches. Ambassadors will be able to record their community outreach over the next year on a special Web site. A selection process will then be conducted to choose one deserving Space Ambassador who, as part of their job duties, will fly to space onboard Virgin Galactic’s SpaceShipTwo. Currently, that flight is expected to be scheduled during the first 18 months of Virgin’s commercial operations. That Space Ambassador will then be expected to conduct further outreach based on their space experience. 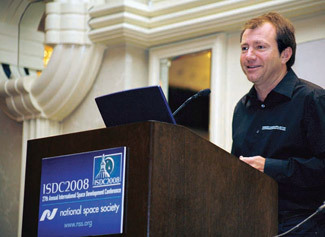 Will Whitehorn, president of Virgin Galactic, announces Virgin’s participation in the new NSS Space Ambassadors program at ISDC 2008. One of the main objectives of the program is to encourage students to pursue careers in science, engineering, and mathematics. In order to continue a presence in space, organizations— including NASA—need future engineers and scientists to conduct research and develop new technology. These industries must continue to grow, especially in today’s world of quickly advancing technologies. Not only will the program reveal the benefits of space exploration and research to the public, it will also promote the next step in commercial flying: suborbital space flights. The commercial suborbital spaceflight business is a developing industry in which Virgin Galactic has established itself as a leader. 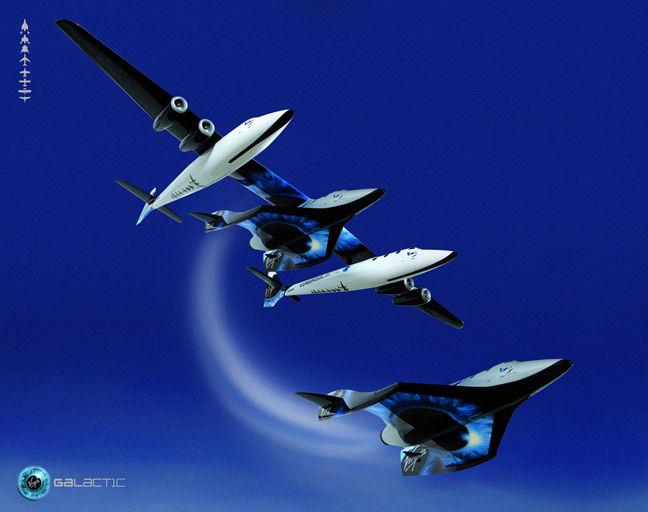 On July 28, 2008 Virgin Galactic unveiled WhiteKnightTwo, the jet-powered carrier aircraft that will carry SpaceShipTwo into suborbital space. SpaceShipTwo will be capable of carrying six “space tourists” at a time. Initial seats onboard currently cost $200,000. Thus, the opportunity to secure a seat on Virgin Galactic’s SpaceShipTwo is an experience many people dream of—and one that is well worth the duties of being a Space Ambassador. Whitehorn explained, “Since I was a kid I have always wanted to go to space.” This dream has fueled him to make trips to space a possibility not only for himself, but for others as well.